Are you free of prejudice? Less than five percent of us are because of the pervasiveness of dualistic, “us”/”them” thinking. 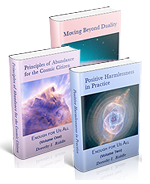 In Moving Beyond Duality, Dr. Riddle draws on research from quantum physics, the life sciences, and the social sciences to describe our actual dynamic energetic reality and expose the unconscious habits that hold the harmful illusion of duality in place. She shows how we depersonalize ourselves and others (including nonhumans) through bigotry, dismissiveness, stereotyping, and objectification. Drawing on the latest research in neuroscience, she clarifies that good intentions are not enough to counter embedded habits. And she provides a series of practical strategies and exercises to uncover depersonalizing habits and create lasting change. 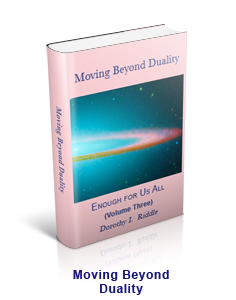 Moving Beyond Duality reminds us that it is relationship and connectedness that define us—whether by their absence or their richness. We are all—human and nonhuman alike—part of the cosmic sea of energy that is the One Life, cherished in our diversity.